If you're a frequent reader of The Crazy Bookworm then you probably already know that I love 'deep' books. Those books that are raw and powerful. Books that make you cry and cringe at the same time. I love all types of books, but I tend to gravitate to the heavier reads more. Where do I begin with All the Rage? I fell in love with Summers' writing ever since Fall for Anything. That book will always stay with me but it now has company. I completed All the Rage in bed, not being able to put it down until I finished the last page, then I was up for at least an 1 hour reeling over it. It's raw and is a powerhouse. This book will definitely leave with a little piece of your heart. Romy is a delicate character. On the outside she seems strong with this hit-me-with-your-best-shot attitude, yet deep down she is broken and scarred. She wears her trademark red nail polish and lipstick as an armour and is meticulous with it's application. This is actually a strong character trait of hers and shows up throughout the novel. My heart absolutely swelled for her while reading this novel. This novel packs A LOT of punch when it comes to storyline, yet I still found it to be a very character driven novel. After all, it's the characters that give the storyline it's depth, right? And if the characters fall flat, then the whole book is out a balance. 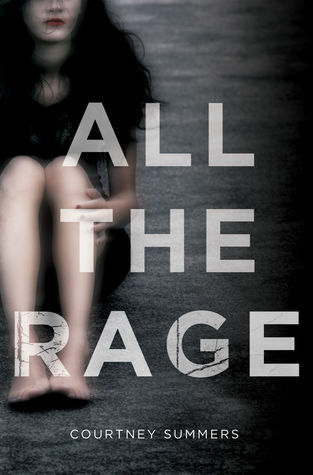 Each character in All the Rage added so much to this book...Each one was necessary! They took this heartbreaking storyline and made it even more real. The writing is nothing short of amazing. Courtney Summers has this lyrical writing style that transports you from wherever you are reading and drops you down gently to whatever world the character is living in. It also flows so beautifully and effortlessly. Her writing style is one of my absolute favourite reading experiences! Even though I devoured this book in nearly one sitting, it will stay with me forever. It took me on an emotional roller coaster with it's raw storyline and beautiful writing style. Thank you for another powerful read, Courtney Summers. You never disappoint! I DID enjoy this book, but the back of the book blurb was so misleading and it'll make many people wonder if they're reading the same book. This is on my TBR. I cannot wait to get it! This is actually an intense individuality mark for hers together with results all over the innovative. My best heart and soul positively swelled on her despite the fact that discovering this innovative. This is information about blogger book. Bookworms will rule the world...After we finish one more chapter! This is a very good informative lines.. This is actually an intense individuality mark for hers together with results all over the innovative.Thanks for sharing such a great blog. This article is incredibly helpful on behalf of me.i am sure as shooting apply this idea as soon early. This is information about blogger book. Bookworms will rule the world. Really enjoyed to read this, thanks for sharing it. I think this is actually an intense individuality mark for hers together with results all over the innovative. My best heart and soul positively swelled on her despite the fact that discovering this innovative. By the way nice post. i am very thanks to u to know more things from this site. Fabulous Post…Thanks for sharing. Hello! I think this is actually an intense individuality mark for hers together with results all over the innovative. My best heart and soul positively swelled on her despite the fact that discovering this innovative. Overall amazing post. I love it so much. Thanks for sharing such a great post. This is nice post, really great and rich content.i like it. It feels good to know that I am on the right track. Great post. I saw that you mentioned publish relevant SEO content.